Dietary fat is fat consumed in the food that you eat. Fat is a major source of energy in the diet, providing nine calories per gram, more than twice the number provided by carbohydrates or protein. Dietary fat is different than body fat which is fat stored on your body. Due to its high-calorie content, the chance of becoming overweight or obese increases with a high intake of dietary fat. The definition of fat (dietary) is different than the definition of body fat. Body fat is excess energy that is stored to provide your body with fuel in times of starvation. Body fat also provides protection for your organs and insulation. Body fat is also called adipose tissue and can be stored as subcutaneous fat (under the skin) or visceral fat (around the organs). The easiest dietary fat definition is simply fat that you eat. There is some fat in many of the foods that you eat even if the food doesn't look fatty or unhealthy. Dietary fat can contribute to body fat if you eat too much of it. But dietary fat also provides important functions in your body if you eat the right kind. When you look at a Nutrition Facts label, you'll see Total Fat indicated at the top of the label. "Total Fat" is listed right below "Calories." 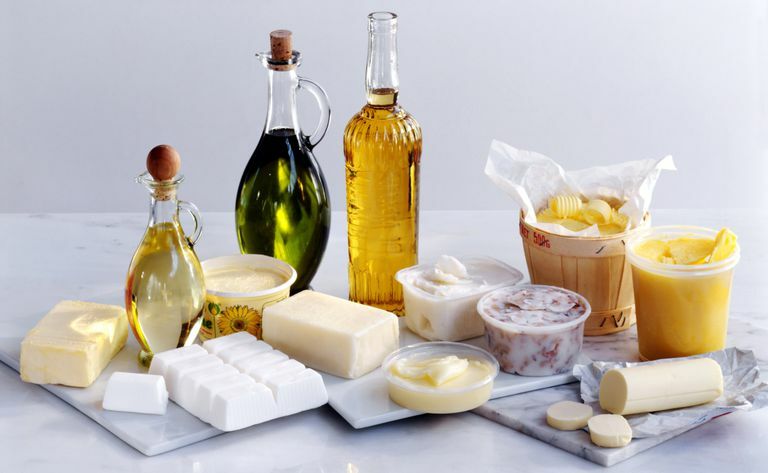 Total fat is the combined value of the different types of fat, including saturated fat, polyunsaturated fat, and monounsaturated fat. Total fat may also include trans fat. There are different kinds of fat that you consume in your diet. Some types of fat are healthier than others. When you eat fat that comes from animal sources it is usually saturated fat. Some plant sources, like coconut and palm oil also provide saturated fat. Saturated fat is solid at room temperature. Examples of saturated fat include butter and beef fat. High levels of saturated fat in your diet may increase the risk of heart disease. So health organizations like the American Heart Association recommend that you limit your saturated fat intake to less than 7% of your total daily calorie intake. The most dangerous kind of fat is trans fat or fat that has been manufactured to be solid at room temperature. Food manufacturers must list trans fat on food labels, but you can also scan the ingredients list for the words "hydrogenated" or "partially-hydrogenated" to find trans fat in your food. Because trans fats provide no health benefits and can be dangerous in your diet, medical experts recommend that you try to avoid foods with trans fat. Often called "MUFAs" monounsaturated fats are often referred to as "good fats." These healthy dietary fats come from plant sources and are usually liquid at room temperature. Examples of monounsaturated fat include olive oil, canola oil, and avocado. MUFAs can help lower your LDL (bad) cholesterol levels, so experts at the Academy of Nutrition and Dietetics recommend that you choose foods with monounsaturated fat instead of saturated fat when possible. Another kind of healthy fat is polyunsaturated fat or PUFAs. Omega-3 fatty acids and omega-6 fatty acids are polyunsaturated fats and provide significant health benefits. For that reason, health experts recommend that you get 3 to 10 percent of your daily calories from PUFAs. Good sources of polyunsaturated fat include salmon, tuna and other cold water fish. Should I Reduce Total Fat? Many healthy eaters aren't sure if they should reduce total fat. The answer isn't necessarily straightforward. Reducing one micronutrient (such as fat) may cause an increase in another macronutrient (such as carbohydrates). In the end, it's the balance of nutrients that is important for good health. Is dietary fat bad for me? The dietary fat that you consume is either burned by your body as fuel or it is stored in the body as adipose tissue. Some fat is also contained in plasma and other cells. Adipose tissue helps to insulate the body and provides support and cushioning for the organs. Dieters might be tempted to avoid dietary fat because it is higher in calories than carbohydrates or protein. Fat provides 9 calories per gram while carbohydrates and protein provide just 4 calories per gram. But eating dietary fat in moderation is important for good health. How much total fat should I consume? Many experts recommend that your diet provides no more than 30 percent of total calories from fat. So depending on your daily calorie intake, your daily fat grams would vary. The USDA recommends that you consume no more than 10 percent of your daily calories from saturated fat and that you avoid trans fat. As you can see from the definition of total fat and learning about different types of fat, there are certain types of fat that are good for you. Just remember to eat all fats in moderation to maintain a calorie balance and reach a healthy weight. What Is Bioelectrical Impedance Analysis (BIA)? Is CLA Worth Taking If You're Trying to Lose Weight?